Mac Devine has 29 years of experience at IBM. 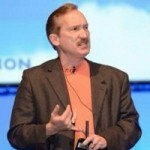 During his career, he has held a wide variety of technical and business leadership roles including Chief Architect for mainframe software, Lead Solutions Architect for Networking Services, Director for Linux Development, Chief Strategy Office for IBM Cloud and currently is the VP and CTO for the Cloud Native Center of Competency for Watson Cloud Division. Mac is an accomplished speaker and author on a wide variety of topics but is most noted for his expertise in Cloud Computing and the Internet of Things. In 2006, Mac gained the designation of IBM Master Inventor and in 2009 he was appointed to IBM’s prestigious Academy of Technology. In 2016, Mac gained IBM’s highest technical recognition with his appointment as IBM Fellow. Mac Devine has 29 years of experience with networking and virtualization. A Master Inventor (2006), IBM Distinguished Engineer (2008), a Member of the IBM Academy of Technology (2009), IBM Fellow (2016). Served 2 years as Chief Architect for System z Enterprise Software. Co-authored Springer’s Handbook of Cloud Computing used by colleges and universities. Served 2 years as the CTO for IBM Cloud partnerships and client innovations within IBM Corporate Strategy team. Lead technical due diligence for SoftLayer acquisition which leads to the creation of IBM Cloud Services Division. Currently serves as Vice President and CTO of the Cloud Native Center of Competency, Watson Cloud Division and as the IBM Executive for Clemson and MIT. Mac is a faculty member for the Cloud Expo, Things Expo, and IoT LinkedIn Community. Mac Devine has presented at IoT Slam twice before, A “surthrival” guide for the perfect storm of Big Data, Cloud and IoT, https://iotslam.com/session/Internet-of-Things-Conference-a-surthrival-guide-for-the-perfect-storm-of-bigdata-cloud-and-iot/ and as a panelist on the IoT Security Panel – Executing IoT Security for a Connected future. The function of the IoT Community is to focus on the adoption & application of IoT in commercial environments, seeking to understand & contribute to applying the technology or overcoming the wide variety of barriers, inhibitors, and technical & operational issues. As a member of the board, Mac Devine will provide impartial input and guidance to the overall vision, strategy, and execution that is helping to shape the current and future direction for the IoT Community, as well as the broader IoT industry.